A radio program this past week was both an eye opener for me, and confirmation that a novel-in-manuscript of mine is not far-fetched at all. On a show called “The Current” from the Canadian Broadcasting Corporation a guest named Mark Goodman spoke about the frightening prospect of computer hackers gaining access to high-tech medical devices implanted into human bodies. This wasn’t science fiction. He’s a futurist who’s worked with the FBI. Such hacking is possible right now, because so many of such devices use WiFi or Bluetooth signals and may be connected to the internet. 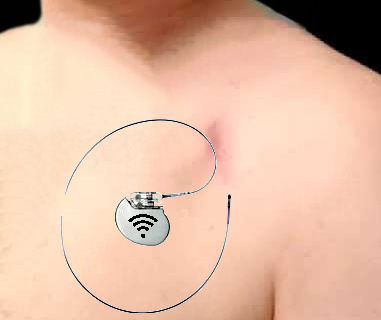 Pacemakers are WiFi-enabled to allow a doctor to remotely trigger a strong jolt of current and save your life if you have a cardiac episode. A great idea, unless a hacker gains access to your pacemaker. Then your life is in their hands, whether for ransom or some kind of sick sport. The insulin pumps of diabetics could be triggered to deliver a fatal dose. Or imagine the horror of feeling your bionic arm or leg controlled by someone else. Hearing obscene or threatening messages in your cochlear implant. All of these things are possible now, or soon will be. Cochlear implants are directly connected to the brain. Experimental eye replacements will be, too, and some prosthetic limbs will have direct neural control. My manuscript (working title: Augment Nation) postulates a time coming soon when brain computer interfaces will take over from smartphones as the must-have accessory. If such devices are left vulnerable by inadequate software, the implications are horrific (worthy of a science fiction novel!) We’ve seen far too many examples of how our laws and law enforcement methods have not kept up with cybercrime, and the cost is huge. We don’t dare let security measures for high-tech medical devices fall behind in the same way. Potential victims are numerous: powerful politicians, bank managers, corporate CEO’s, aircraft pilots (military and civilian), missile silo operators, security staff for bio-tech labs…it takes no effort to imagine dozens of scenarios in which hackers could use deadly leverage to achieve almost any goal. Terrorism? Let’s not even go there. And that’s not mentioning the threat from people who are simply twisted, or psychopathic. Feel the urge to unplug your house and curl up under a blanket? Our society already has many regulatory structures in place to ensure that new medical treatments do no harm. For instance, drugs have to go through numerous levels of testing before being approved for the general population. Harmful side effects or interactions with other medications prevent approval. It’s not a perfect system, but it certainly helps. Why not require security safeguards for medical technologies: refuse to approve their use unless they meet a certain standard of cyber-security? There may be no such thing as an “un-hackable” device, but encryption and well-scrutinized code can go a long way. For once, let’s not wait to play “catch-up” with the criminals. Let’s get ahead of them and make sure that the benefits of brilliant new technology aren’t undermined by vulnerabilities.